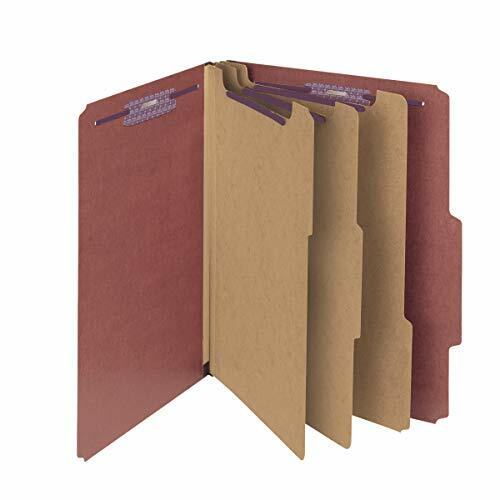 Smead - Pressboard Classification Folders Self Tab Letter Eight-Section Red 10/Box "Product Category: File Folders Portable & Storage Box Files/Folders"
Pressboard Classification Folders Self Tab Letter Eight-Section Red 10/Box - The ultimate classification folder when safety and security are most important. 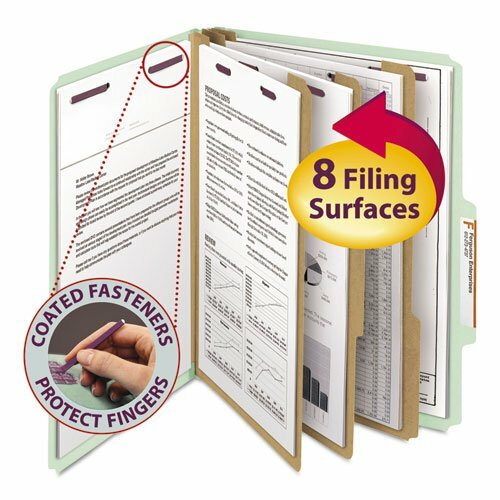 - SafeSHIELD® bonded fasteners add protection for papers and fingers while also reducing fastener crinkling. - Made of pressboard for extra durability. - Classification Folder Type: Top Tab Size: Letter Number of Sections: 8 Cover Material(s): 25 pt. - Pressboard. The ultimate classification folder when safety and security are most important. 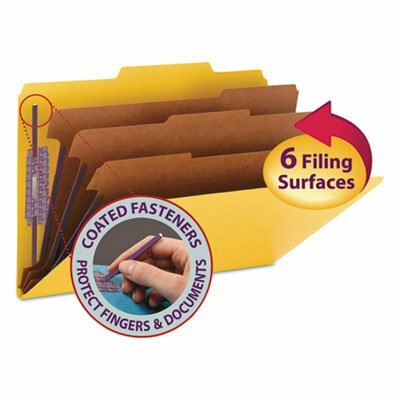 SafeSHIELDÂ bonded fasteners add protection for papers and fingers, while also reducing fastener crinkling. Made of pressboard for extra durability. Variety of colors for color-coding projects. 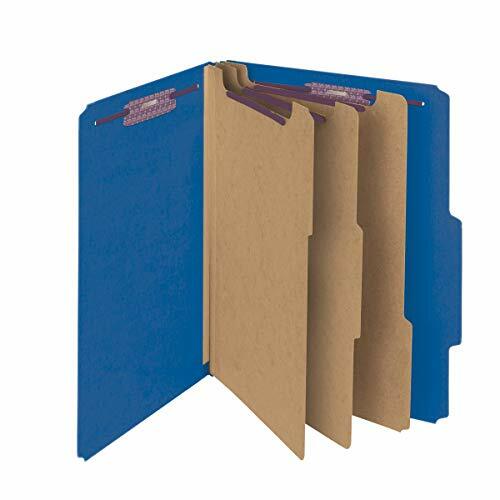 3" Expansion Classification Folder 2/5 Tab Letter Eight-Section Blue 10/Box - The ultimate classification folder when safety and security are most important. 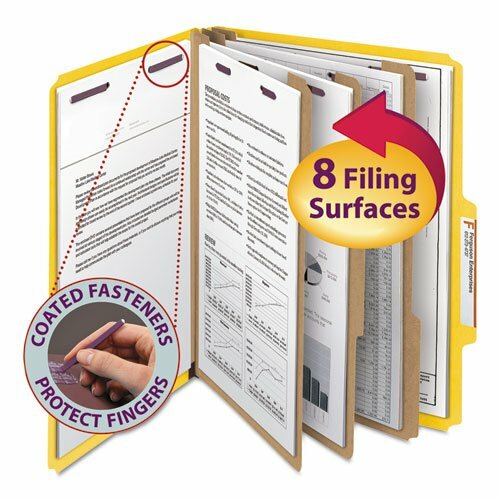 - SafeSHIELD® bonded fasteners add protection for papers and fingers while also reducing fastener crinkling. - Made of pressboard for extra durability. - Variety of colors for color-coding projects. - This product was made from wood sourced from a certified managed forest. - Classification Folder Type: Top Tab Size: Letter Number of Sections: 8 Cover Material(s): 23 pt. - Pressboard. The ultimate classification folder when safety and security are most important. SafeSHIELD? bonded fasteners add protection for papers and fingers, while also reducing fastener crinkling. Made of pressboard for extra durability. Variety of colors for color-coding projects. This product was made from wood sourced from a certified managed forest. Classification Folder Type: Top Tab; Size: Letter; Number of Sections: 8; Cover Material(s): 23 pt. Pressboard. The ultimate classification folder when safety and security are most important. SafeSHIELD? bonded fasteners add protection for papers and fingers, while also reducing fastener crinkling. Made of pressboard for extra durability. 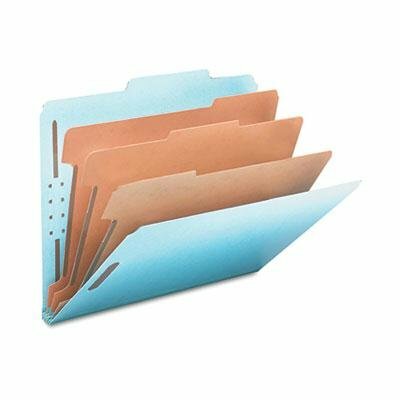 Classification Folder Type: Top Tab; Size: Letter; Number of Sections: 8; Cover Material(s): 25 pt. Pressboard. 11 pt. manila stock. 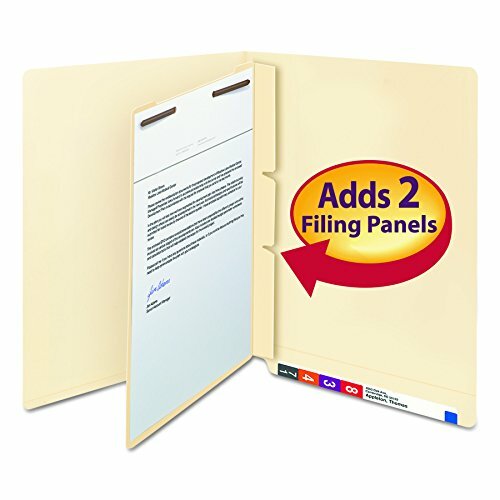 For end tab or top tab folders. Standard 2-3/4-inch slit punching. 1-inch twin-prong fastener. Smead 100 Years of Excellence. The ultimate classification folder when safety and security are most important. SafeSHIELD bonded fasteners add protection for papers and fingers, while also reducing fastener crinkling. Made of pressboard for extra durability. Variety of colors for color-coding projects. This product was made from wood sourced from a certified managed forest. Classification Folder Type: Top Tab; Size: Letter; Number of Sections: 8; Cover Material(s): 23 pt. Pressboard. Compare prices on Smead Eight Section at LiveSaler.com – use promo codes and coupons for best offers and deals. We work hard to get you amazing deals and collect all avail hot offers online and represent it in one place for the customers. Now our visitors can leverage benefits of big brands and heavy discounts available for that day and for famous brands. We try to makes comparison shopping easy with Product Reviews, Merchant Ratings, Deal Alerts & Coupons. Find Deals, Compare Prices, Read Reviews & Save Money.